At 12 inches in overall length, this is about as much knife as you'll want to carry on your belt, and Kershaw does provide a hard plastic ABS sheath for that. Since the blade is a little light for anything more than filleting fish, you'll probably find it fits better in the tackle box, where the tough sheath protects the fine seven-inch cutting edge from harm. Ground and tempered for uniform flexibility, the knife's edge will need regular maintenance if you want it razor sharp. Pack a honing steel or whetstone in the tackle box and be prepared. For slippery work like cleaning fish, the quality of the handle is as important as the blade. The co-polymer grip molded around the Kershaw fillet knife's tang provides a deep bolster in front and a smaller dropped heel in the rear to prevent slips in either direction. The wide oval of the palm section is ribbed for better traction and allows firm control of the knife, even when hands are cold and clumsy. The knife cleans up easily and does resist corrosion well, but modern stainless steel is a compromise between edge-holding and rust resistance. After the fishing trip, clean and dry the knife and don't store it in the sheath where moisture could still be trapped. 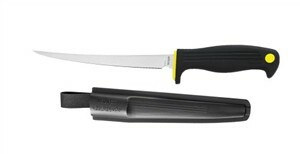 See the Kershaw Fillet Knife with 9-inch blade if you need a strong but economical knife built for larger fish.